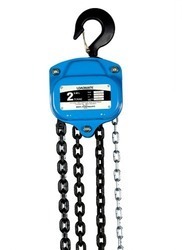 We offer Chain Pulley Block to our clients. We are engaged in offering a quality range of Chain Pulley Block which is efficiently manufactured by our vendors. Our range of technically advanced chain pulley block is designed in such a way that provides superior performance. Our company holds immense experience in this domain and is involved in offering wide assortment of Chain Pulley Block. We are highly acknowledged organization engaged in presenting remarkable range of Heavy Duty Hoist. 01) Our Range of Manual Chain pulley block Starting from 1000 Kg to 15000 KG with the Standard lift of 3 meter and the construction of gear box Spur gear assembly with case hardening.